Step aside, RoboCop. Harnessing the power of global businesses is the latest way to fight crime. On April 25, the U.K. announced a new effort to fight tax fraud across e-marketplaces, asking businesses such as Amazon.com Inc. and eBay Inc. to commit publicly to tackling the issue among online traders. The U.K. has asked e-marketplaces to sign an agreement to educate users on value-added tax, provide data to the U.K.’s tax authority, and react swiftly to non-compliance, according to a government news release . The agreement, set to be published with a list of signatories, is a major step in the U.K.’s fight against VAT fraud and marks a shift in large companies’ societal role. VAT fraud costs the U.K. as much as 1.5 billion pounds ($2.1 billion) a year. Cracking down on fraud in e-marketplaces has become a priority for the U.K. due to foreign traders skirting the levy on their sales in the country. This evasion hurts U.K. traders’ competitiveness as they must charge the levy. Levied on the sale price of goods or services, VAT is a key source of the U.K.’s public finances, making up 21 percent of the 594.3 billion pounds collected by the government in the latest financial year. Similarly, the U.K. is a key country for online marketplaces. Last year, it was Amazon’s fourth-largest and eBay’s third-largest individual geographical markets, according to their annual reports. Rival business Etsy Inc., meanwhile, lists the U.K. in its own 2017 annual report as a “core” market. In April 25 emails, spokespeople for Amazon and eBay told Bloomberg Tax they will sign the U.K.’s agreement. They declined to comment further. An Etsy spokeswoman didn’t respond to Bloomberg Tax’s requests for comment on whether the New York-based business will sign the agreement. The public disclosure of which e-marketplaces have signed the agreement will “put the spotlight” on those that haven’t, Rathmell said. Overall, the initiative “shows how determined HMRC are to drill down into this area, where there’s a huge tax loss,” she added, citing the U.K.’s tax authority, Her Majesty’s Revenue and Customs. HMRC hasn’t always received praise for the way it has dealt with VAT fraud. Last April, the country’s National Audit Office noted the government had no cohesive strategy by 2013 to respond to the growing threat that overseas online traders posed to the U.K.’s tax take. Amazon and eBay executives, meanwhile, faced a public grilling from lawmakers in September 2017, with one accusing the companies and the U.K.’s tax authority of “turning a blind eye” to VAT fraud. Online marketplaces “have not been taking the issue seriously,” the Public Accounts Committee said in the October 2017 report that followed eBay and Amazon appearing before it the previous month. 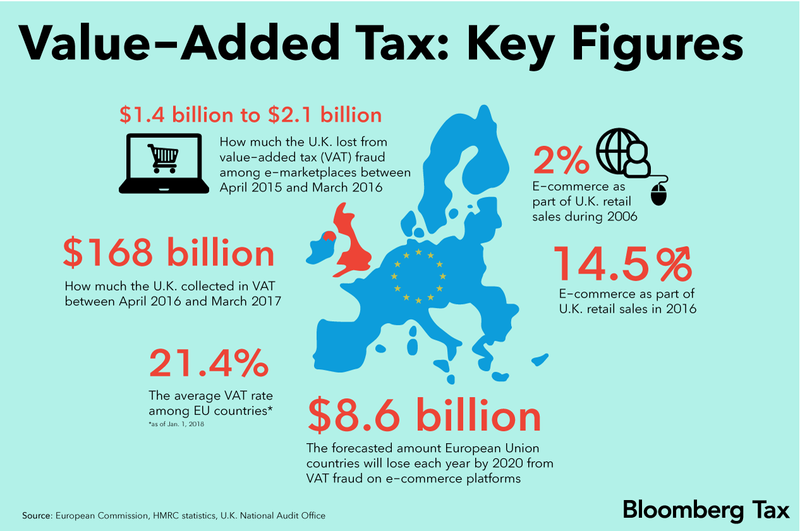 The growth of e-commerce, and the ease for online traders worldwide to sell through sites like eBay, lie at the heart of why online marketplaces are the focus of the U.K.’s VAT fraud debate. In 2006, online sales accounted for 2 percent of U.K. retail activity, according to a National Audit Office report. A decade later, they made up 14.5 percent, with half coming from e-marketplaces. This growth has benefited the U.K. economy, but it has left it “open to abuse,” HMRC said in 2016 guidance . The U.K.’s fight against VAT fraud among online marketplaces truly began two years ago. In 2016, it made the likes of Amazon and eBay equally liable for the tax evaded by overseas traders. The following November, the Treasury then said it would make marketplaces liable for VAT of local traders as well after overseas sellers set up U.K. shell companies to avoid the previous legislation. Lastly, it launched a scheme this month that enforces more compliance measures on warehousing businesses, further targeting the supply chain of online foreign traders to U.K. consumers. Boosting the U.K.’s efforts on VAT fraud, the 2016 legislation is already showing results for HMRC. The new laws have resulted in the tax authority sending 1,300 notices of non-compliance to overseas traders using e-marketplaces, HMRC Chief Executive Jon Thompson said in a March 27 letter to the chair of the Public Accounts Committee. In turn, these notices have yielded 120 million pounds, he said. In the letter, Thompson also noted for the first time that HMRC has been working closely with online marketplaces to agree on a way to improve the U.K.’s compliance efforts over VAT fraud. HMRC will remove businesses that fail to keep the required standards, it said April 25. The U.K.'s tax authority was likely working with eBay and Amazon on the agreement for the past year, Rathmell said.